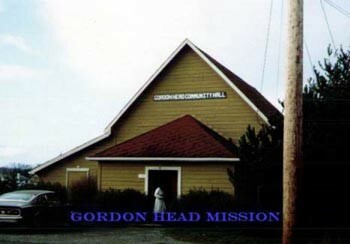 Gordon Head Mission started in February 1980 with a small group of families and Father Joseph Jackson CSSp. as first Pastor. After three years of praying and meeting at the Gordon Head Community Hall on Tyndall Avenue, where Mass was first celebrated on February l7, 1980, a new facility was opened. Holy Cross Roman Catholic Church on Gordon Head Road was blessed on February 27, 1983. The Parish has, since the beginning, been a welcoming community of volunteers active in liturgical and social events. Under the leadership of Father Joseph Jackson, Sister Pat McMahon and Father Leo Robert, the parishioners knit together as a Parish and University Community. The University Catholic Community flourished under the guidance of an ecumenical team of which Father Leo Robert and Sister Judi Morin SSA were members. Sandra Lucier was the University Chaplain from 1990 to 1996. In the summer of 1996 Kate Fagan Taylor joined the Pastoral Team as University Catholic Chaplain. 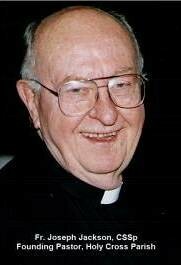 With failing health not allowing Father Jackson to take on the full burden of a new, active parish he became our beloved Pastor Emeritus. Upon the death of Father Leo Robert in June of 1990, the Diocese supplied a priest for Sunday Masses only. Jean Laturnus was subsequently appointed Parish Administrator by Bishop Remi DeRoo that same June. In September of 1990 Father Ken Bernard was appointed our Pastor but only served for a short time as he was posted to Vancouver the following January. Later that year, Father Robert Pare was appointed Pastor. He remained until poor health forced him to retire in January 1995. In August of 1995 a Dominican House was established on Dawnview Crescent and Father Rolf Hasenack O.P. was appointed Pastor. Father Rob Reyes O.P. served as Associate Pastor until the spring of 1999. A campaign was launched to build a new Parish Centre, which was opened in March of 1999. Jean Laturnus retired in September of that year and Cynthia Bouchard-Watkins was hired to serve as Parish Coordinator. The old “farm house” located on the property served us well, having been used for parish offices, classes, University students’ meeting place and a residence, until it was sold by the Diocese in the spring of 2002. In January of 2004, Fr. Rolf Hasenack O.P. moved to Saanich Peninsula Parish and we welcomed Fr. Michael Favero, who had been serving in Parksville. In our community many activities fill the calendar of events which mark the active parish life of Holy Cross. A typical week sees many people praying, working and socializing while fulfilling the Parish Mission Statement, which states that we are “a Catholic Christian Community comprised of the residential and University communities of Gordon Head that, under the guidance of the Holy Spirit and in communion with all the parishes of the Diocese of Victoria, serves the people of God by living and proclaiming the Gospel of Jesus Christ our Lord and Redeemer.” We have been, and continue to be, a blessed community of believers!